Blue grenadier fish, also known as hoki, blue hake or whiptail fish, is a saltwater fish commonly caught in New Zealand. The meat is white in color, and is fairly soft when compared with other, more common fish like salmon and tuna. Blue grenadier has a light, clean taste, and can easily be paired with a variety of sauces or garnishes based on personal taste. Take the fish out of the refrigerator and rinse it with cold clean water from the tap. Pat the fish dry with clean paper towels and cover it with plastic wrap or wax paper to warm up to room temperature for one hour. Brush the fish on both sides with extra virgin olive oil. Season the fish all over with sea salt and coarse ground black pepper to taste. 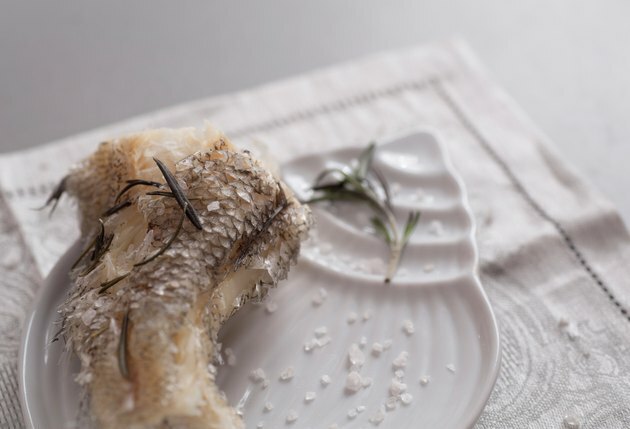 Place the fish in a baking dish and bake it for 15 minutes. When the fish is fully cooked, the outside will be a light golden brown color. Transfer the fish to a serving plate and allow it to rest for five minutes before serving. Heat 1 tbsp. extra virgin olive oil in a large sauté pan until hot but not smoking. Place the fish in the sauté pan and cook it for four minutes. Flip the fish over and cook it for an additional four to five minutes on the other side. Place the fish in a broiler pan and cook it for five minutes. Flip the fish over and cook it for an additional five minutes on the other side. You can add fresh herbs like finely chopped rosemary or herbes de Provence to the fish along with the salt and pepper for additional flavor.